They call it The Luck of Edenhall. 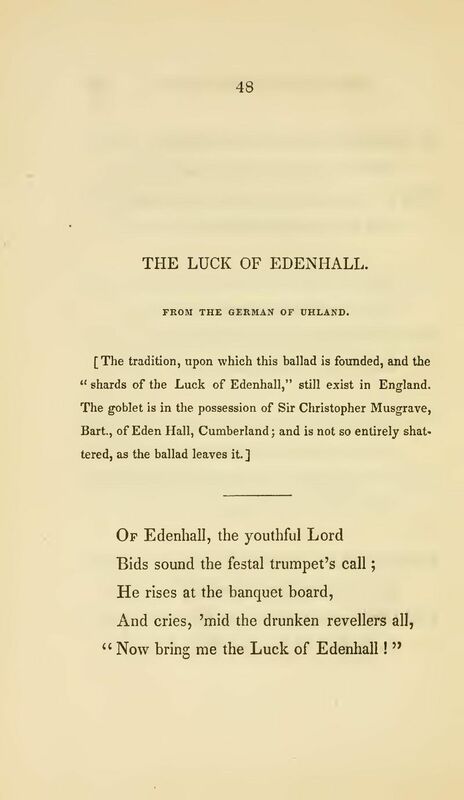 It beams from the Luck of Edenhall. Farewell then, O Luck of Edenhall! Of the joyous race of Edenhall! The glorious Luck of Edenhall. “For its keeper takes a race of might. The gray-beard in the desert hall. The shards of the Luck of Edenhall. Digtet er en oversættelse af »Das Glück von Edenhall« af Ludwig Uhland. Teksten følger Henry Wadsworth Longfellow: Ballads and other Poems, 2nd edition, John Owen, Cambridge, 1842, pp. 48–52.